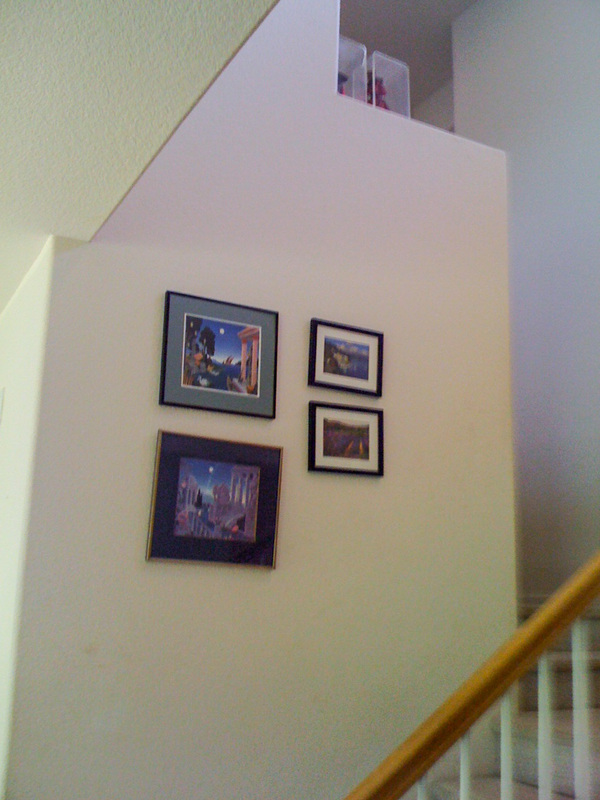 I thought I'd start a series that shows how the staircase in our house gets decorated as we go through the year. Actually, I suppose the first installment was the post from last fall featuring all things autumn on our stairs (click here to see this 'prequel'). 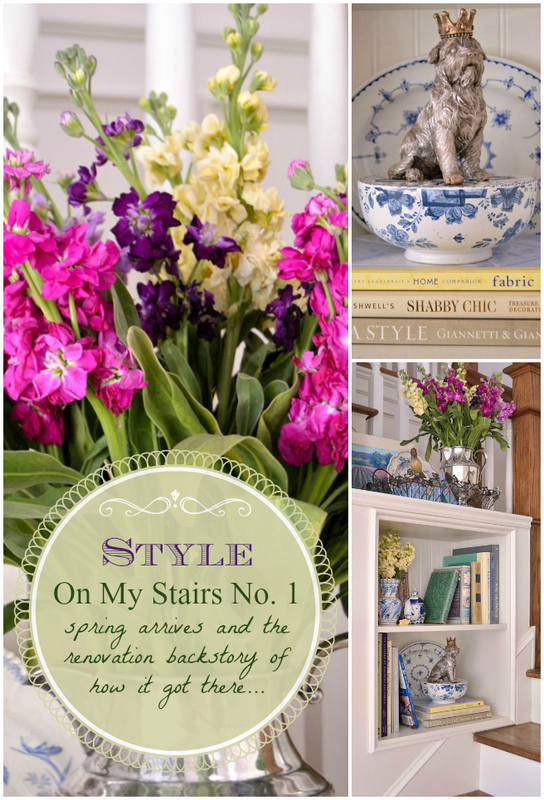 So, for this almost-inaugural staircase post, let's have a quick review of the backstory for this part of our house....and then I'll show you what early spring style looks like on my stairs these days. 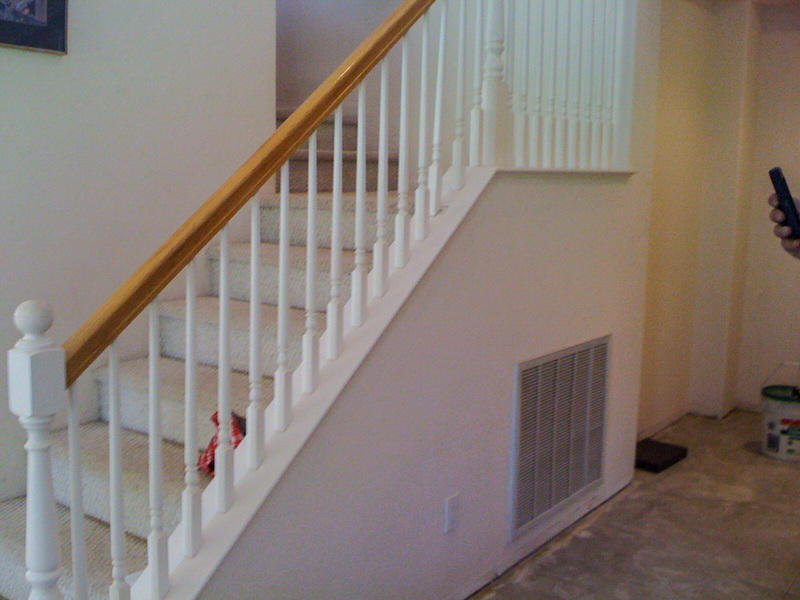 We started off with the totally uninspired builder-grade staircase that came with the house, which I've shown below in a couple 'before' photos. Remember the mysterious black monolith from '2001: A Space Odyssey'? 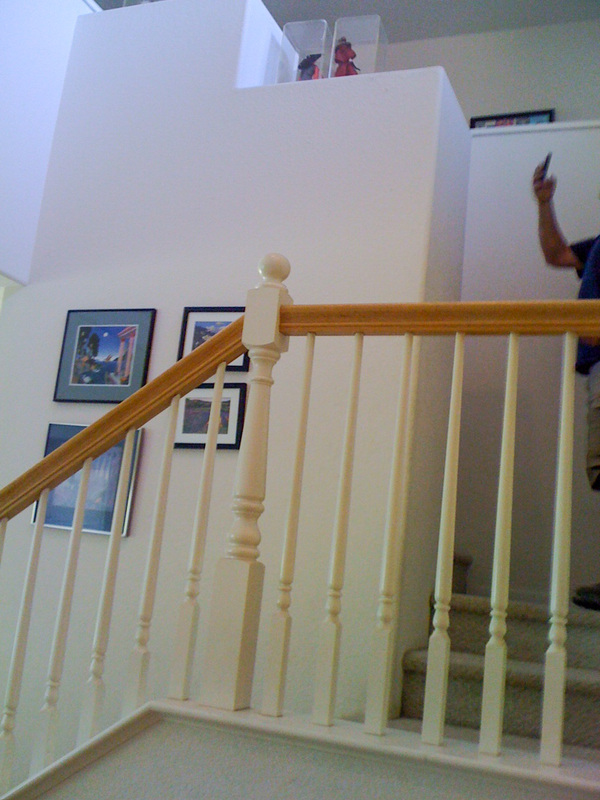 That big block of drywall you see below between the first and second flight of stairs was it's cousin. A big, white, Thing that loomed over and dominated the front hall and the stairs and made anyone standing in the front hall feel like they were standing at the bottom of a deep, white, featureless well. Lowering the stair-stepped top of that central feature and removing the half walls that extended along the second story halls and replacing them with elegant white balusters opened the whole area up. We also re-did the stairs themselves by removing the old wall on the first flight, so that we could see profile of the risers and treads. Adding molding and wall frames, along with the little bookcase/display area and decorative stair brackets gave the space some much needed character. Adding character and architectural flourishes was my goal back when we were re-designing and renovating the stairs. I love the quirky little details and unique, custom features that one sees in older homes and wanted to add that to our stairs. I saw this renovation project as an opportunity to create fun little nooks and crannies for display and decorating. ......and never more so than when I have a pretty bunch of flowers, such as this bunch of stock that I bought to celebrate the arrival of early spring. Every time I walk up or down the stairs past this little display area or through the front hall, I smell the spicy, fresh scent-- perfect reminder that spring has arrived. .....much of it from my mom, who loves blue and white. That oval blue Furnivals Denmark serving platter is part of my mom's old collection that she gave to me-- I grew up eating on these plates. .......something that I bought from an artist at a street fair in Santa Barbara a few years ago. This blue plate is also from my mom, and as you can see its been mended a few times. It doesn't matter, it still has sentimental value for me, and I love the open, informal pattern and the pretty fluted edge. The upper shelf on the modified 'monolith' is a challenge to decorate, since it is viewed three different ways: when standing below and looking up, from the second story hall, or from the landing. Nothing is prettier than bright flowers combined with the gleam of silver. I'm getting a lot of mileage from this old silver pitcher. 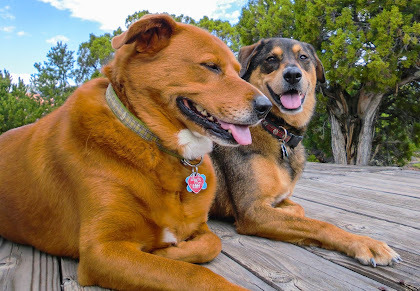 Why do dogs like to race up and down the stairs, especially when you are on them? Stay tuned as the seasons continue to unfold on my stairs and thanks for stopping by! This is a great update to a staircase and I adore the arrangements. Just stopped by from the Snickerdoodle link party. Thanks for sharing. Thank you Stephanie! And thanks for stopping by for a visit. From the initial photo that I viewed today, I didn't realize your home was new. Fun to see the transformation of your stairs. What a beautiful difference! Love your whimsical style. The bird with the acorn hat, the crowned dog figure, and the bird that holds the pocket watch ~ all totally charming. Can you give me details about these pieces? Who makes them? Where you found them? Sarah, I'm so glad you found me and that you are having fun visiting! Yes, trying to add some character to our basic, builder house has been a very long process. It was just a big, new, white box when we moved in. 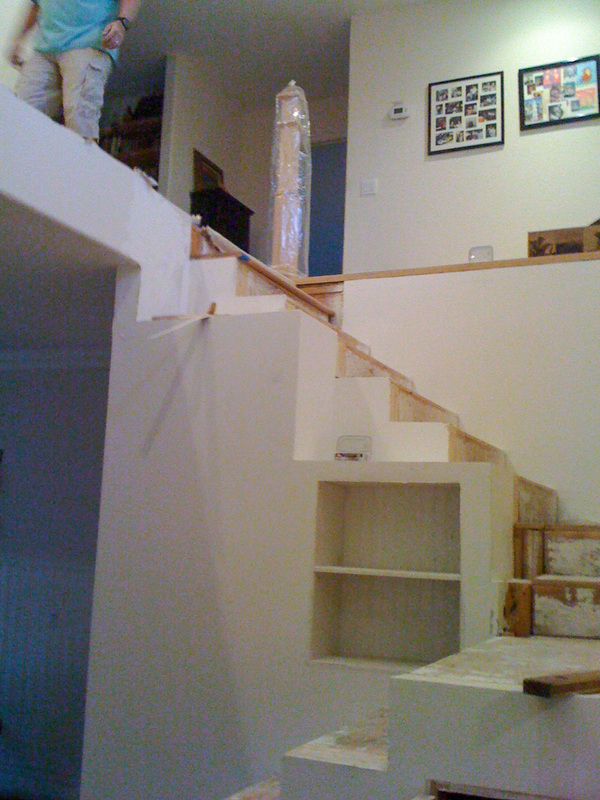 Re-doing the stairs took the longest; we thought it would take only a few months and it ended up taking about a year. Phase 2 is upstairs and has yet to be completed. The crowned dog came from Vintage Begonia (http://vintagebegonia.blogspot.com/) a cute little store in Old Town Temecula, CA. Unfortunately there is no label or mark on it, so I don't know who makes it. The bird with the acorn hat and the bird man holding the pocket watch came from a shop in downtown Riverside, CA called Mrs. Tiggy Winkles (https://www.facebook.com/pages/Mrs-Tiggy-Winkles/628736680474468?rf=154170447964250). Neither has a maker's mark or info either. Both may still be available at Mrs. Tiggy-Winkles, but as far as I can tell, she doesn't have online retail. I love what you did with your stairs. The little shelf is so sweet and a great way to showcase treasures. Your stairs are truly beautiful. Thank you Debbie! The crowned dog came from Vintage Begonia (http://vintagebegonia.blogspot.com/) a store in Old Town Temecula, CA. Unfortunately there is no label or mark on it, so I don't know who makes it. I'm a bit confused; did you do 2 different staircases? I see pictures of stairs going opposite directions. I'm assuming that the image was reversed but just thought I'd ask. I love you style and the finished stairway is so pretty! Love those little extra spots to decorate! Thank you! We only have one staircase (with two flights). You might have been looking at the photo of the reflection of the staircase in our hall mirror. Even though your stair project has been completed for awhile, it was just reposted and this is the first I've seen it. I really like how you opened the top of the stairway. In addition, the angles on your molding are a nice change from the normal wainscoting the you see. Nice job! Thank you! For some reason this went into spam, and I just noticed it.